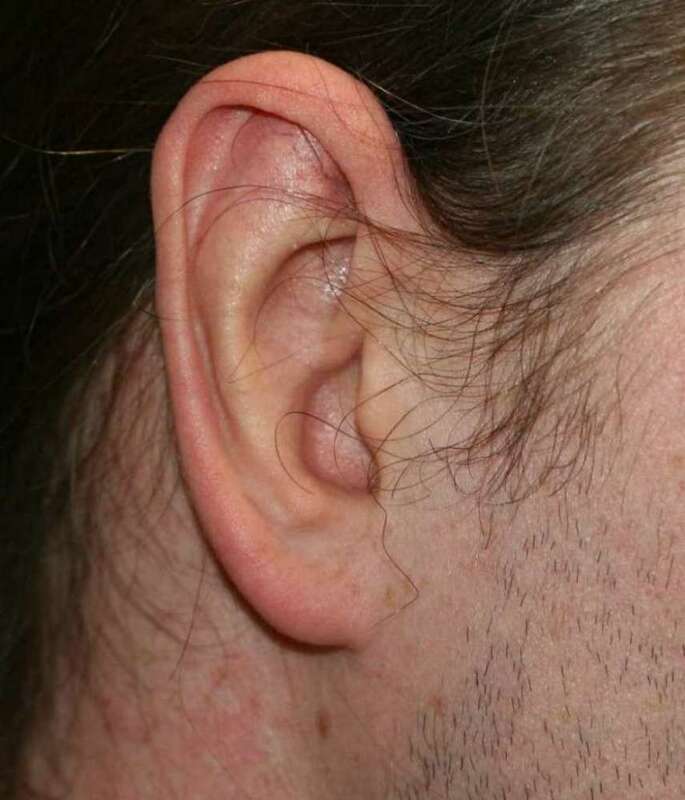 Many patients feel that their ears are too big. 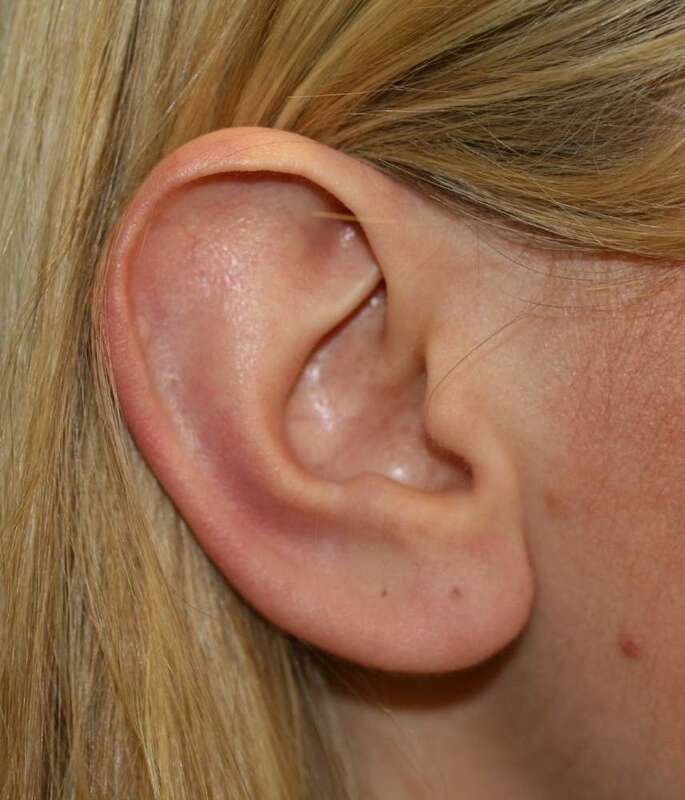 Macrotia is the the medical term for ears which are physically too large when they are measured. 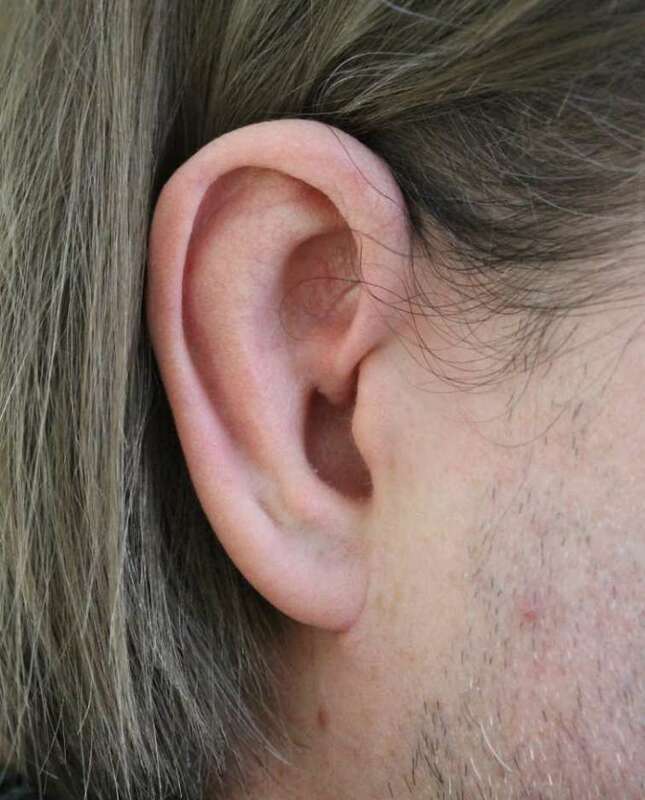 Ears can be made smaller at the upper poles (the tops), or at the ear lobes or both. 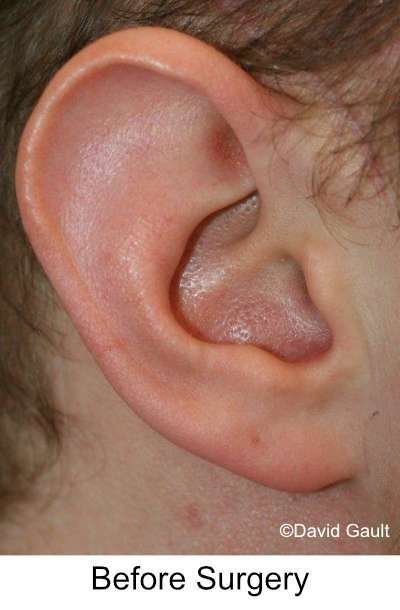 This surgery is called ear reduction or macrotia surgery. 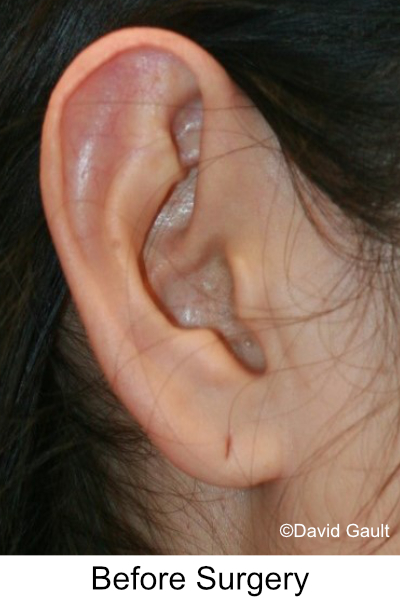 A number of techniques for reducing the size of the ear have been developed over recent years. 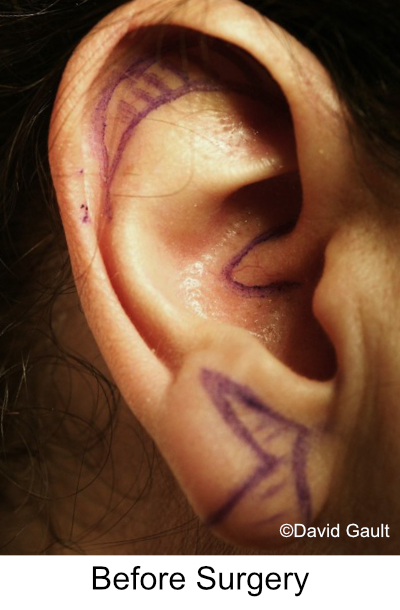 Some of these work quite well, but at the risk of notching the rim of the ear. 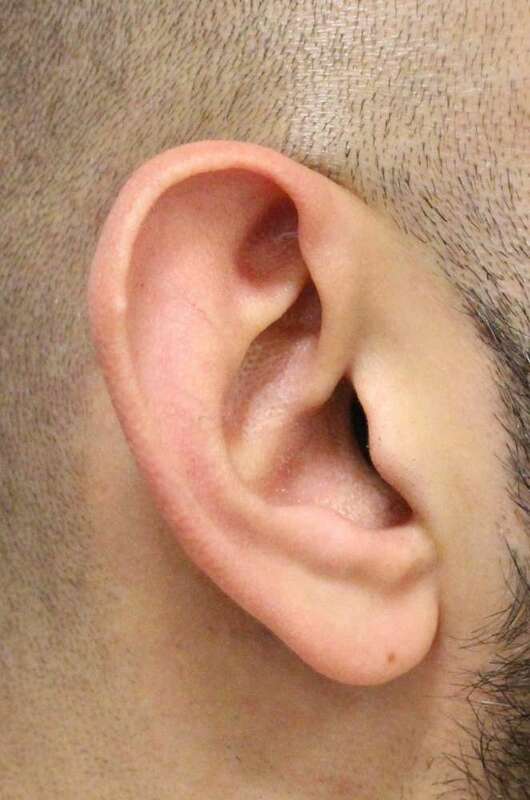 The most successful technique uses an incision hidden in the folds of ear, usually just inside the rim. 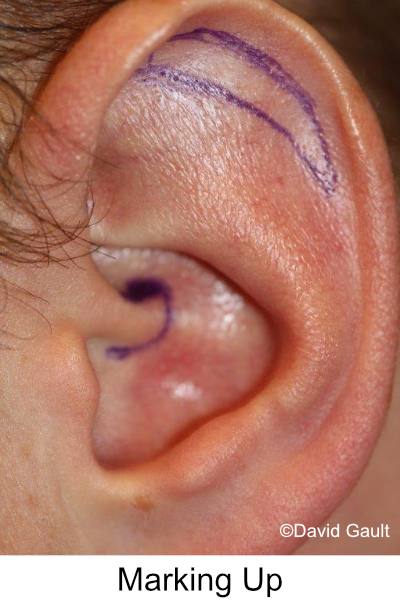 A crescent shaped piece of tissue is removed from the over-large area of the ear, exactly tailored to rebalance the relative sizes of the scaphal and conchal areas of the ear. Reductions of a centimetre in height are not uncommon. 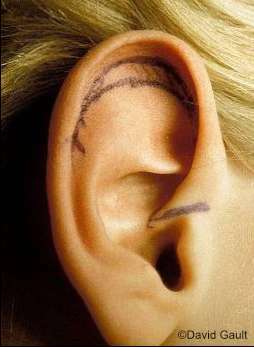 Ear reduction surgery at the upper pole can be used to improve the apperance of "Spock"ears or ears which look pointed. Surgery normally takes about 90 minutes, and is normally performed under local anaesthetic as a walk-in, walk-out case. 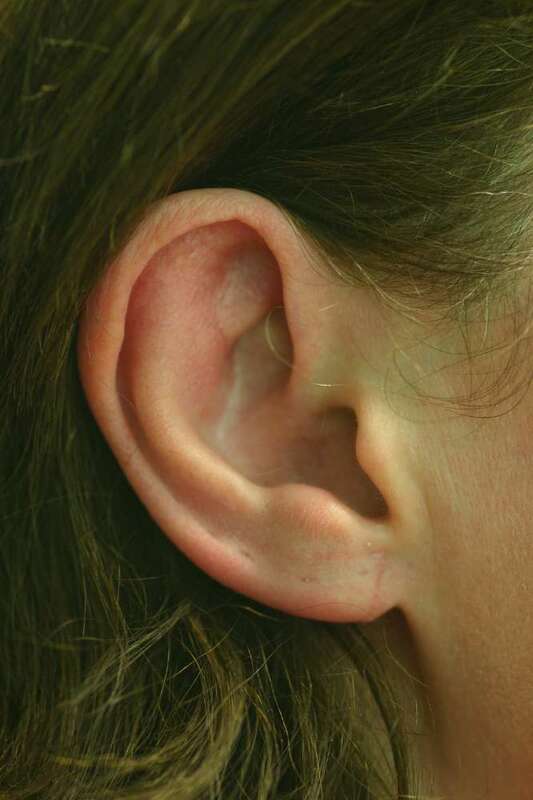 A wrap-around bandage is applied after surgery to protect the newly-operated tissues, and it is best that this is kept in place for seven days. 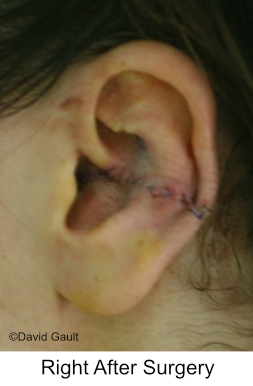 Some patients prefer that the bandages are removed earlier, and this can be accommodated, although there is a risk that the ears can be inadvertently damaged, when sleeping, for example, and for this reason, it is recommended that a protective headband be worn at least until sutures are removed. 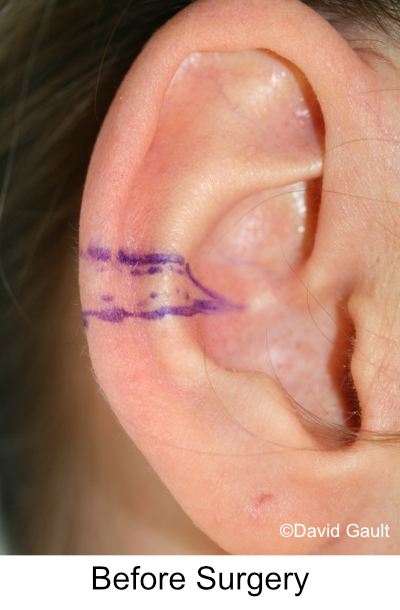 In some of the before and after examples below, the incision and suture lines are shown at an early post-operative stage, sometimes immediately after surgery, and some at the time of suture removal, so that you are able to see the incision lines and how the ears look before healing. 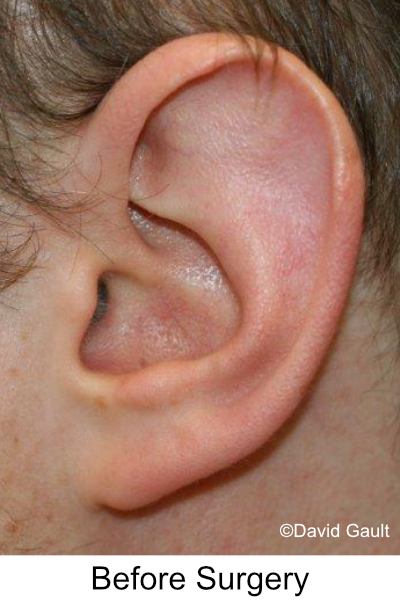 Combination surgery normally takes about two and a half hours, and is normally performed under local anaesthetic as a walk-in, walk-out case. 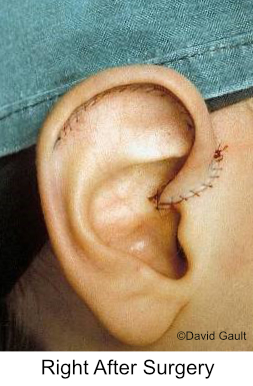 A wrap-around bandage is applied after surgery to protect the newly-operated tissues, and Mr Gault prefers that this is kept in place for seven days. 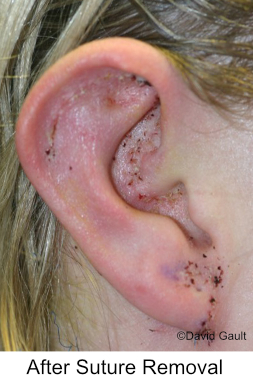 Some patients prefer that the bandages are removed earlier, and this can be accommodated, although there is a risk that the ears can be inadvertently damaged, when sleeping, for example, and for this reason, Mr Gault recommends that a protective headband be worn at least until sutures are removed. 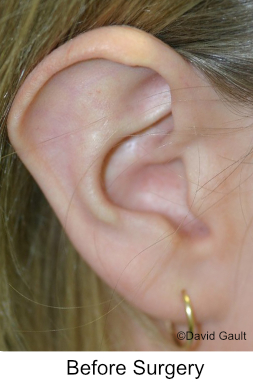 A poor pinnaplasty can affect the shape and balance of the ear in a number of ways which make it look unnatural. 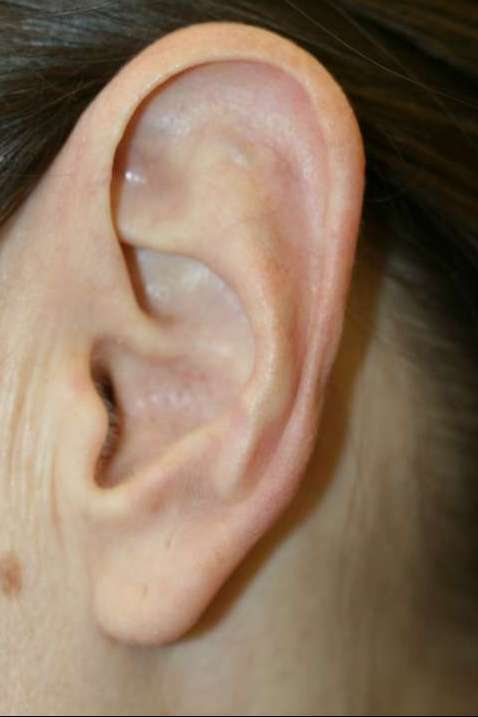 Some ears become very triangular after surgery for stick out ears, others become long and thin. 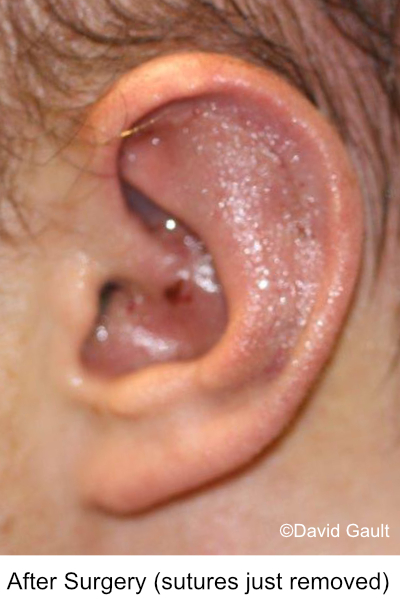 others can become kidney shaped or uneven. 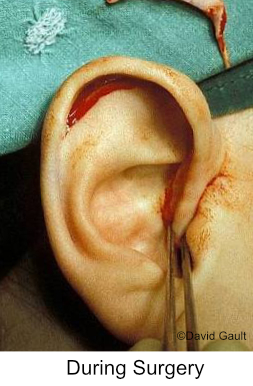 Ear reduction can sometimes be use to minimise the deformity after a failed otoplasty. 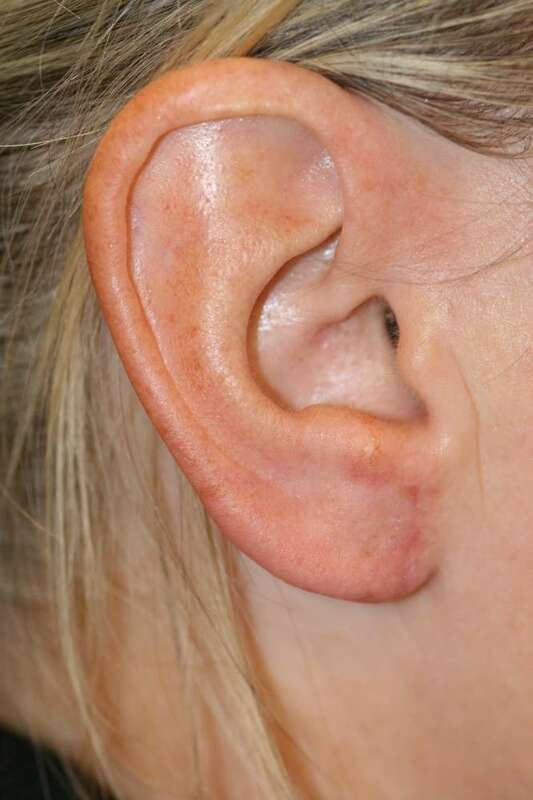 Ear lobe reduction surgery takes about one hour, and is normally performed under local anaesthetic as a walk-in, walk-out case. 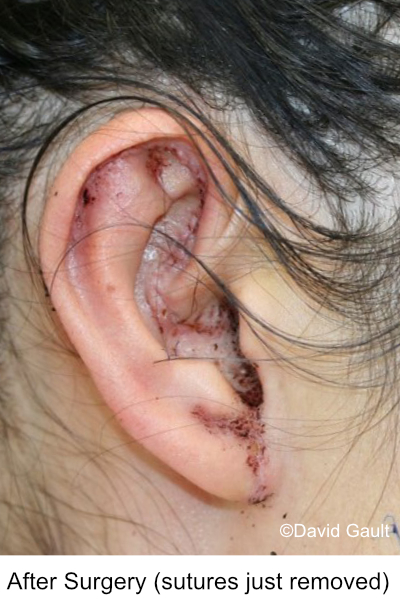 After surgery the lobes are covered with some flesh-coloured tape. 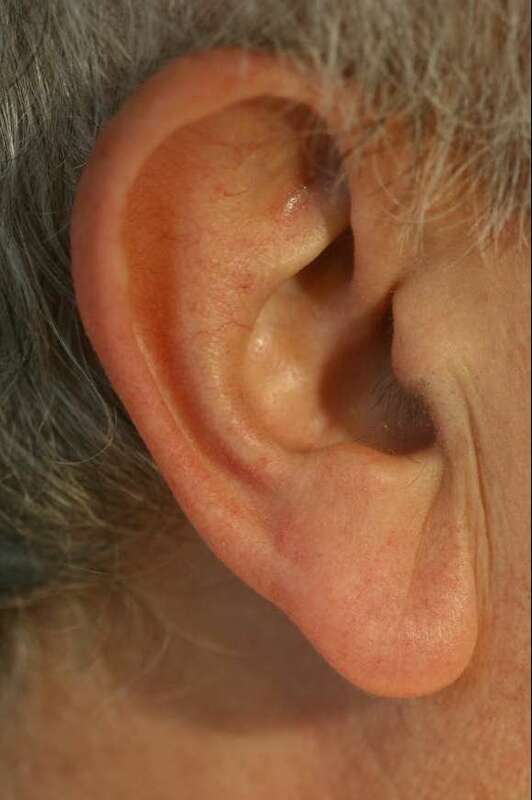 Large ears which also stick out too much from the side of the head should not be corrected in one go, because the cartilage of the ear can twist and deform, and the skin-covering can lose its blood supply and die. 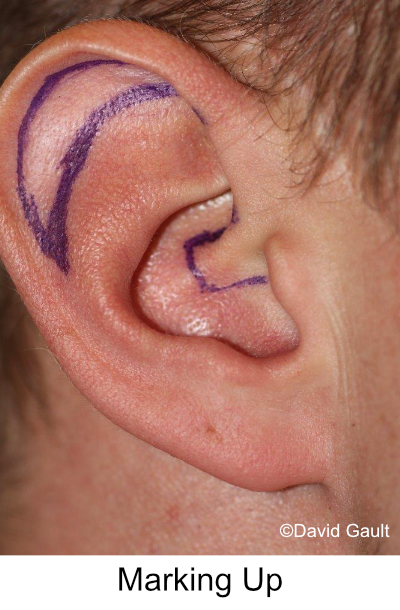 The goals are best achieved in two separate operations, the first to make the ears smaller and the second to set them back, separated by at least three months. 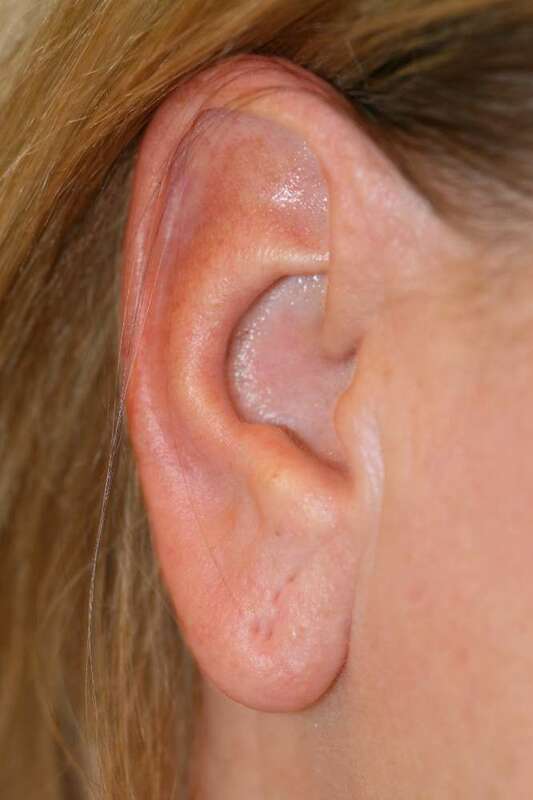 Although it is possible to set back the ears first, and then reduce them in size at a later date, this surgery is more difficult, since the set back surgery tethers the ears to the side of the head and so the amount by which they can be made smaller can be restricted. 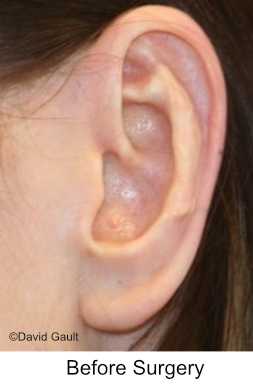 Set back of the ears can be combined with ear lobe reduction however. The surgery can be carried out under local anaesthesia, intravenous anaesthetic or general anaesthetic The surgical fee is the same whatever type of anaesthesia you choose. The anaesthetic and hospital fees for local anaesthesia is usually less than other types of anaesthesia. Local anaesthetic procedures can normally be undertaken as an out-patient (walk-in, walk-out) whereas you would need to stay in hospital as a day case if you chose to have a general anaesthetic (GA) or IV sedation. It would be unusual to require a night’s stay in hospital. 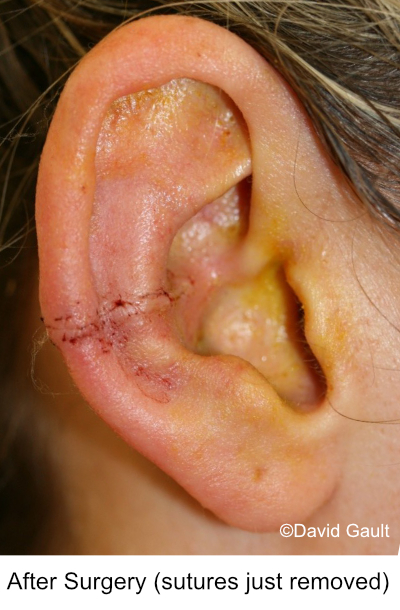 Sutures are removed at approximately seven days, at which point the scars will look slightly red. 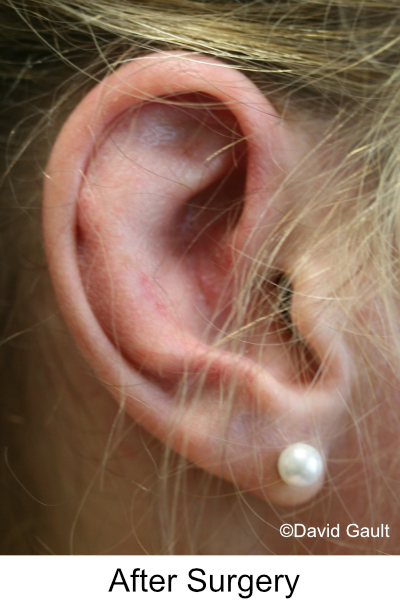 Treatment with Dermatix settles the redness more quickly. 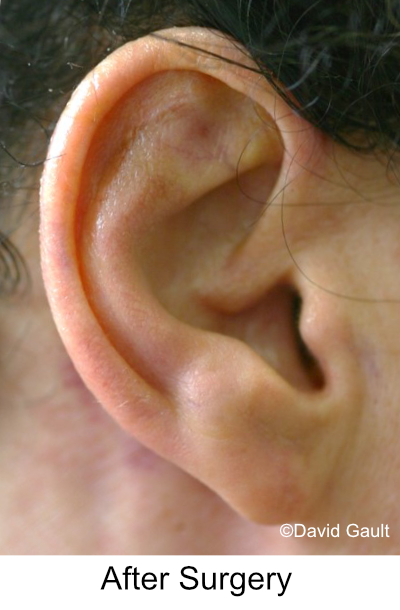 There are no health implications or risks to hearing. "After 30 years discerning over my ears I finally took the plunge to se Mr Gault. There are some negative comments about his approach but I found him to be a witty person with a self depreciating dry humour. 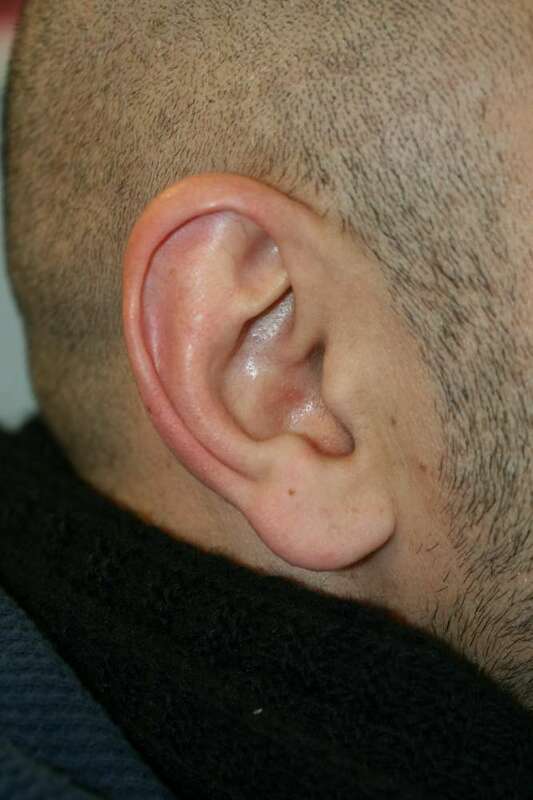 He told me he would help and what he could do and a few weeks later I went to the Clementine in Harrow and underwent the procedure under local sedation. The following week was loooong !! Bandaged up it when I want back to London and the sutures were removed I was more than impressed with he results. 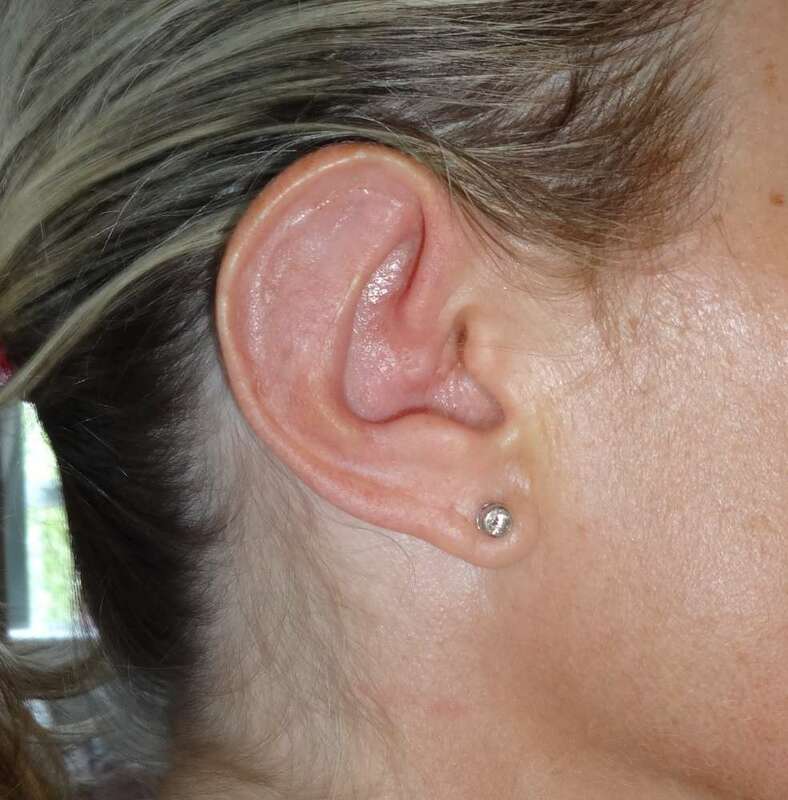 Amazingly nobody even mentioned my ears unless I told them which pays testament to natural sculpture and skill of the surgeon. Thanks Mr Gault and also a word to the theatre nurses at the Clementine who were also first class."